When you live in Kimberley you don't have as much to do and see as you have in the bigger cities, but I love Kimberley. It is a wonderful city to live in and for kids to grow up in. Kimberley's history is amazing and we even have a Ghost Route, which Keagan went on with a friend, who is hosting an exchange student from Germany. They had so much fun and took videos of the ghosts, as apparently you can only capture them on video and not on photos. On the N12 towards Cape Town, we have a fairy hideout. Chloe and Zanne was so amazed by all the fairies and gnomes staring back at them that they could hardly move. Writing about fairies and gnomes makes me think back, years ago, to before I had any grandchildren. A very close friend of mines’ daughter use to often go on holidays with us. 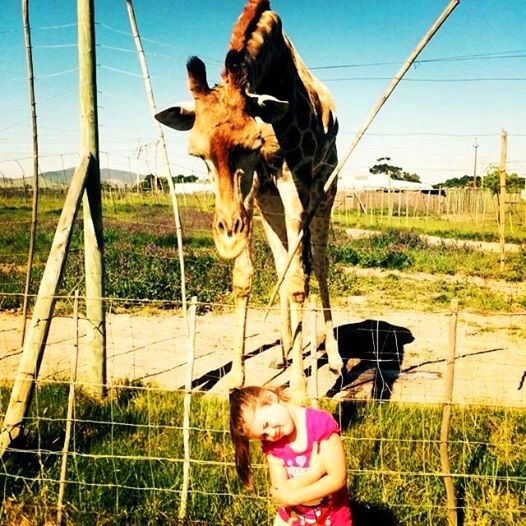 She was about 4 years old when we visited the Tsitsikamma forests and the biggest tree along the Garden Route. I told her we must go look for fairies, because they are everywhere, but only children can see them. It didn’t take too long before she saw her first fairy. She was so excited, she couldn’t stop talking about it and she was very impressed that only she could see them, since adults had lost their believe in “magical creatures” and therefore can not see fairies. Kimberley was also the first city in the Southern Hemisphere to install electric street lighting and the first to have an electric tram in South Africa. Today I realized again what a blessing it is to be a granny and to have the privilege of spending wonderful quality time with my grandchildren. Keagan the eldest has his Grade 7 farewell tonight and he looks so handsome, after he had me shopping for 3 days solid. Chloe received a medal after passing her first ballet exam. Now I have to learn those same steps, but I can see she is on the brink of giving up on me -her excuse being, I am not trying hard enough and those “nobbles” (bunions) on my feet is the reason I can not do ballet. This weekend was an extremely busy weekend in Kimberley - it was the GWRU 130 year’s reunion. All the living GWRU players were here to enjoy the festivities. I think this festivity attracted even more people than the very popular Gariep Festival did in August. Keagan had 2 friends over for the weekend and they wanted to play rugby but needed another player, so I volunteered. His friends thought I was joking and not one of them wanted to be on my side. They voted Matthew to be my partner but after 5 minutes they all wanted to be my partner :-) I could still run, tackle and drop kick and they just could not stop me. I got up this morning with a major headache, thinking I will never get through the day, but I had an early show house, so I rushed to make a biltong platter. While at the show house, I remembered that I had another show house at 11am and needed another platter. I managed to make a delicious mini sandwich platter faster than Speedy Gonzales. The tenant at my second show house is Heidi De Wee, a lovely lady that sells beautiful ball gowns and wedding dresses. I promised her that she could make my ball gown when I go to Las Vegas in April next year, for the Mannafest. After all this I finally had a chance to go for lunch with my husband at Mugg & Bean.